# Slit the sausages into 4 pieces at first, and then dice them. # Particularly fry them with some oil. # Boil the mushrooms in the salted water with lemon juice, drain it, cut them into 5-6 pieces. # Dice the pickled gherkins also. 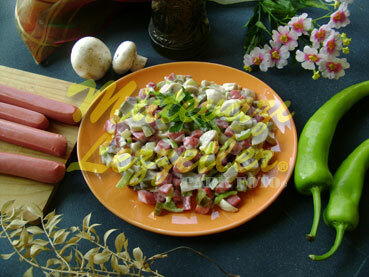 # Put fried sausage pieces, chopped mushrooms, pickled gherkins, long green pepper and onion into a big bowl. # Add mayonnaise in it and mix. # Sprinkle salt finally and serve. Note: There is no need to add extra oil into this salad because of the fat in sausages and the oil in mayonnaise.